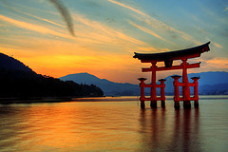 Itsukushima Shrine was registered as world heritage in 1996. The registered area is Itsukushima Shrine itself, the sea in front and background forest of 431.2ha including Misen Primary Woods (designated as natural monument). 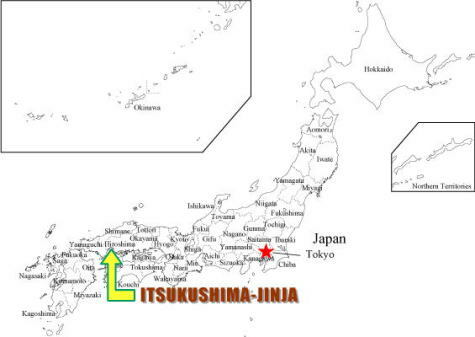 The area covers 14% of whole Itsukushima region. Itsukushima Shrine gives a unique landscape under the grand-scale plan unlike the world ever seen, the vermillion lacquered shrine pavilions on the sea warter with the background of greenery mountains. Out of the shrine complex of 17 pavilions, Otorii (Grand Gate), Five-storied Pagoda, Two-storied Pagoda, 6 properties are designated as National Treasures and 14 properties are designated as Important Cultural Assets. Itsukushima Shrine was first formed the beautiful basic construction in 12th century by the ruler Kiyomori Taira. The complex of the pavilions has excellent beauty of the architecture adopting 'Shinden-zukuri (Aristocratic mansion)' style. The landscape of the pavilion on the sea water with the mountain background is very unique. This asset was created by the eminent imagination of Kyomori Taira, and it shows his achievement in Heian era. The whole island has been worshipped as the land of God, and they build the pavilion in the sea because they thought it was august to build it on the God's land. Other than main pavilion, there are counstructions of stages, bridges and other shrines. Honden (main sanctuary pavilion) has the elegant gabled form. The main sanctuary of Itsukushima Shrine is dedicated to three goddesses. General visitors worship the goddesses at a hall of worship located in front of the main sanctuary. Though the present building was reconstructed in 1571 by Feudal lord Motonari Mori, it is a faithful reproduction of the original architectural style dating back to 1168. 'Otorii (Grand Gate)' is an entrance to a Shinto shrine. Otorii stands in front of the shrine pavilions in the sea because people used to visit Itsukushima Shrine from the sea. Otorii is 16 meters high and weighs about 60 tons. Its two big pillars were made using natural camphor trees between 500 and 600 years old. Built using a traditional Japanese construction technique, these pillars stand by themselves without requiring any other means of support.